In a few days, the biggest mobile event on the planet kicks off in Barcelona. Yes, the city is known for its Gaudi architecture, its Miró art, and one of the best soccer clubs in the world. But the city is also known for the Mobile World Congress, where the biggest names in phones announce their latest and greatest gadgets. The rumor mill is in full swing, talking about many new products: Samsung Galaxy S5, Nokia’s Android phone, Samsung Galaxy Gear 2, Sony Xperias, Huawei Ascend P6S, ZTE phablet, and Intel chips. Besides the handset vendors, there will be many semiconductor and processor IP companies displaying their latest products and demonstrations. And here’s where the trickiness starts. 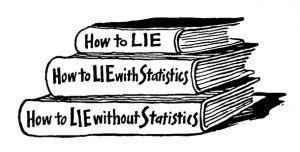 Mark Twain popularized the famous quote “There are three kinds of lies: lies, damned lies, and statistics.” Twain was talking about the persuasive power of numbers, and in particular the misuse of statistics to bolster weak arguments. In computing, the quote is often turned into “lies, damned lies, and benchmarks” because there’s no magic formula for evaluating computer performance, and processor vendors go to great lengths to ensure they look good on a benchmark, even though it doesn’t always correspond to a great end-user experience. At the Mobile World Congress, you’ll see many processor demonstrations that show the display and perhaps a camera above the desk, but cleverly hide the processing underneath the desk. These demos give the impression that the software runs on a low-power, small-die-size processor, but in fact they’re running the software on a 100-Watt, $1000+ PC platform. Indeed: Lies, damned lies, and demos. Most of you will have heard of the 80-20 rule, and it applies here, too. When you see a demonstration that looks like it’s 80 percent there but it’s based on a PC platform, they’ve really only tackled 20 percent of the issues that will arise as they turn it into a real low-power, high-performance silicon-based demonstration. So when you happen across a fantastic demo at the show, don’t just believe your eyes; be sure to ask what’s hiding under the desk.